Vitamin B6 is a nutrient involved in energy metabolism, nervous system function, and numerous human biochemical processes. It’s essential for healthy adrenal, immune, and cognitive function. There are three different natural forms of vitamin B6: pyridoxine, pyridoxamine and pyridoxal—all of which are found in foods. The most active form of vitamin B6 is pyridoxal-5-phosphate (PLP or P5P), which serves as a co-factor in more than 150 enzymatic reactions. Dietary B6 must be converted in the liver to pyridoxal-5-phosphate before being used in biochemical processes. B6 is a synergist to magnesium and zinc. Adequate magnesium is important to the functions of B6; B6 is necessary for zinc absorption; a B6 deficiency must be ruled out whenever a zinc deficiency is detected. Helps make melatonin, an important hormone that supports the body’s natural sleep cycle and cellular health. People who don’t get enough B6 in their diet have a higher risk of heart disease. Increased homocysteine (>8). B6 deficiency can also be associated with an increased C-Reactive Protein (CRP) independent of homocysteine levels. I want to thank Dr. Harry Eidenier, the grandfather of functional blood chemistry analysis for this clinical pearl: On a blood chemistry, when the AST or GGT is decreased below 10, the need for vitamin B6 is likely. Eye Health. Vitamin B6 reduces the risk of developing age-related macular degeneration, an eye disease that can cause vision loss. Cancer. Studies have shown that B6 can inhibit the growth of cancer cells. Low B6 status contributes to the onset and/or progression of tumors, especially GI tumors. A study published in the American Journal of Clinical Nutrition (April 2017) concluded that vitamin B6 deficiency is associated with an increased risk of colorectal cancer. Rheumatoid Arthritis. Low B6 has been associated with rheumatoid arthritis. Some studies also suggest that people with RA may need more B6 because chronic inflammation lowers B6 levels. Pregnancy. It’s important for women to maintain an adequate B6 status throughout reproductive years. B6 deficiency has been associated with an increased risk of preterm birth and early pregnancy loss. The body has an increased need for vitamin B6 during pregnancy. It’s important for maintaining hormonal and fluid balance of the mother and for healthy development of the baby’s nervous system. During pregnancy, vitamin B6 helps control morning sickness and nausea. Maternal B6 deficiency can increase the risk of autism. In double-blind trials, vitamin B6 combined with magnesium resulted in behavioral improvements in roughly one-third of autistic children. Kidney Stones. Years ago, Harvard researchers demonstrated 10mg of vitamin B6 taken with 100mg of magnesium daily reduced calcium oxalate kidney stone incidence by over 90%. Are you at risk of vitamin B6 deficiency? B6 deficiency affects the entire body and is associated with a number of adverse health effects, higher levels of inflammation, oxidative stress, poor blood sugar control, and an increased risk of colorectal cancer. Depression, OCD and schizophrenia. People with mood disorders, anxiety, ADHD, depression, bi-polar, schizophrenia, alcoholism and OCD should all be screened for pyroluria using a simple urine test. Those with pyroluria have reportedly improved after dosing with higher doses of vitamin B6 and zinc. 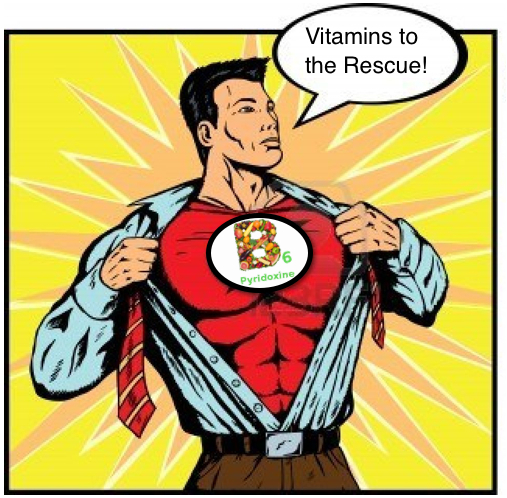 B vitamins are water soluble, meaning the body does not store them. In order for B6 to be used by the body, it must be converted to pyridoxal-5-phosphate before being used in biochemical processes. This conversion process takes place in the liver. Individuals with compromised liver function have difficulty making this conversion and consequently may be at risk of a vitamin B6 deficiency. If supplementing with vitamin B6, it’s important to use the active form of B6, pyridoxal-5-phosphate (P5P). Supplementation with P5P can prevent vitamin B6 deficiency. If pregnant or breast-feeding, always seek the expertise and advice from a qualified practitioner prior to supplementing with P5P. Do you have a B6 deficiency? A functional blood chemistry analysis is one the best methods of self-care. A blood chemistry analysis is a smart investment in your health, identifies your unique nutrient deficiencies and can help to bring your body chemistry into balance.